David Paris Dentistry uses a variety of methods to keep you comfortable. I am afraid of dentistry. Can you help? With more than 30% of the population having some fears about going to the dentist, Dr. Paris goes out of his way to have your appointment go smoothly. For example, you might want to watch television or a DVD on our screens to help a dental appointment pass more quickly. Some of our patients enjoy being distracted with a cartoon or sitcom to make them giggle or even getting tips on new places to eat or shows to see from Dr. Paris. You can even bring your own DVD if it would help you feel at ease. We offer sunglasses to keep the bright lights out of your eyes. We even have satellite radio to make your visit more pleasant. Our digital x-rays give you far less radiation and provide us with a much clearer picture of your mouth, which means we can be less invasive in our treatments. If there is anything else we can do to make your experience better, just let us know. What kind of x-rays do you use? Some people are concerned about their exposure to radiation during dental x-rays. This is understandable because some medical x-rays – especially older film based units have relatively high radiation outputs. To improve your quality of care, we have invested in a new, more precise way of looking into your mouth – digital x-rays. 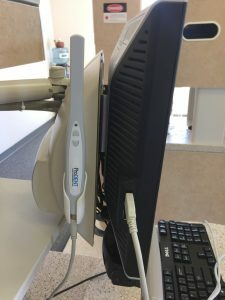 Advantages of digital x-rays include an 80 percent reduction in radiation over traditional dental x-rays, incredible precision, and a nearly instantaneous image that can be reproduced any number of times for insurance or referral purposes. Digital x-rays are also better for the environment, as they do not require chemicals for developing the image and can be stored on our computer, thus saving paper and eliminating the need for toxic chemical developers.